A couple of weeks ago I wrote a little bit about the challenges of getting to grips with an instrument other than one’s own.I’m now back in Philadelphia, playing again on that same “other” cello, and it’s fascinating how one development has changed my perspective on the events of my last visit. I really struggled to get a sound out this cello last time I was here- it literally would not speak on short notes on the lower strings without a great deal of strategizing and coaxing. I partly ascribed that to it not being played for several months, as well as to the differences in setup between it and my home axe. I don’t think the blog post I wrote at the time quite gets across just how frustrated I was at the time. In the end, just as I was figuring things out, I noticed a buzz starting on the day of our final concert. I reported this to the instrument’s owner and advised him that this probably meant that a seam (the glue join between the ribs and either back or top of the cello) had come unglued.When I returned this week, I got a report on the repair- it turns out that there wasn’t just a seam open. 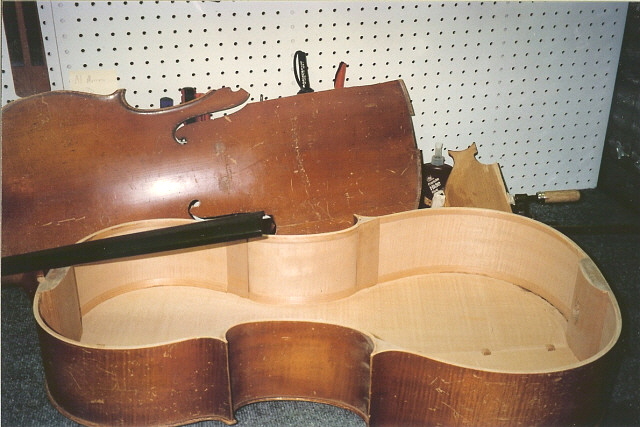 To hear my friend’s description, so many seams were open it was a miracle the back of the cello hadn’t just fallen off completely. This, of course, would completely explain why I struggled so hard to get the instrument to speak. Without a solid connection between the ribs and the two vibrating plates, the mechanical action of the instrument couldn’t work. Now repaired, the cello is as smooth as butter to play.What I find a bit amusing is that while it did occur to me that there was something not quite right with the cello, I diagnosed it as stiffness from a lack of use. Rather than thinking it needed to go to the shop, I thought that I had perhaps better arrange some time with it farther in advance of a first rehearsal in future- in other words, I was guilty of cello neglect. It never occurred to me that it was actually broken. I think this is an outgrowth of my traditional upper-Midwestern stoicism, which I find is getting worse every year. I can feel myself turning into one of Garrison Keillor’s semi-silent old men of the Great Lakes region who can never ascribe the cause of any failing to anything but themselves. This experience was an almost comical example of me refusing to make an excuse for myself. I think I was quite close to not noticing the back of the cello falling because I was so focused on finding a sounding point that would get that damn pianissimo staccato low F# to speak.Of course, I’ve also had a lot of exposure to folks for whom the instrument is always the problem. You can read about them here. Apparently there are woodwind players out there (a minority, I hasten to add!!!!) who’ve never actually made a mistake without it somehow being the fault of a broken instrument. This time around, I keep interrupting rehearsal to tell David and Caroline how much better everything is working and what a lovely cello this actually is. I fear they’re getting a little fed up with the new, happy Ken.All this doesn’t necessarily mean that I’ll sound better this time than last time- sometimes the struggle to overcome a problem pushes us to play better. I did a performance of the Debussy Sonata once during which I broke a string. Not only did I lose the string, the three remaining strings when completely haywire. Not a single note would have been anywhere close to where it had been for all the weeks I’d been practicing. I had to re-finger tons of things on the fly. Of course, when I listened to the recording, my playing got WAY better after this mishap- I was concentrating so hard that I played at a completely different level.I don’t know if others have this experience, but more often than not, the more miserable I am, the more it feels like every note is a complete battle, the better the recording sounds.Great life, eh?